What are winter tire studs? Winter tire studs are designed to be installed on studdable winter tires, and work to supplement traction in select winter conditions. Studdable winter tires are sold without studs. They must be acquired and installed separately. 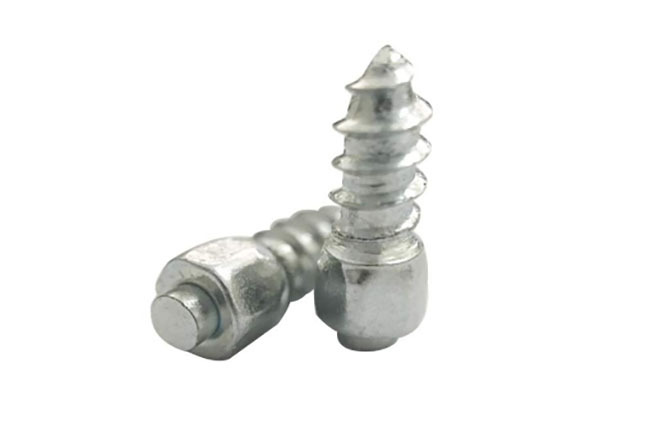 Winter tire studs have a large diameter cylindrical end that roots down into the tire tread, and a small tungsten carbide pin that extends from the “active” end of the stud. Hard rubber studs are also available. Once installed, the top pin of the stud extends beyond the surface of the tire tread by about 1/32", and works to penetrate frozen roadways to provide extra grip. Think of studs as hammering and clawing into frozen precipitation under wheel rotation. Alternatively, some off-road truck studs have a screw design that lodges them into the tire tread. How are winter tire studs installed? Each stud is individually inserted with a “stud gun” into preset locations. The stud holes are clearly visible on studdable winter tires like the General AltiMax Arctic 12. Stud sizes vary, and each studdable winter tire is engineered with a particular size of stud spec’d. (The TSMI chart above outlines the various stud sizes.) 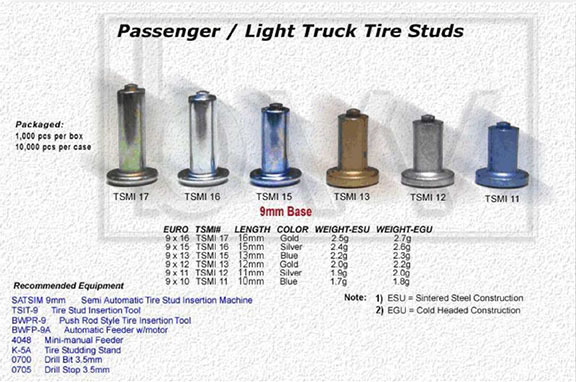 Proper stud size for the tire is necessary, and is indicated on the tire sidewall by many manufacturers. Tire shops will do stud installation work and professional installation is recommended by TireBuyer. Can all winter tires have studs? Only studdable winter tires can have studs installed. These tires have been engineered with preset locations (holes) for the studs. Attempting to stud studless winter tires could cause structural integrity issues, and compromise the performance and safety of the tire. What are advantages of studdable winter tires? Studded winter tires have one proven performance advantage over studless: Studded tires provide superior grip on icy and hard-packed snowy roads. The traction characteristics of modern studless winter tires like the Michelin X-Ice Xi3 on icy roads are excellent; substantially better than the traction offered by any all season tires. A studless winter tire provides its traction benefits primarily due to the enhanced wintertime grip of the unique, specially-designed tire tread compound, and its road surface interaction. But in the case of ice, the coefficient of traction can only be so strong. Studded winter tires provide an additional level of grip because they’re not just interacting with the road surface conditions; the studs penetrate frozen precipitation, and dig in like miniature anchors. When the driver accelerates, brakes, or turns on ice with studded winter tires, he or she has the combined advantage of both the winter tire compound and studs clawing into the ice, which improves grip and vehicle handling responsiveness. Are there disadvantages to studded winter tires? Yes. Studs are really only advantageous in icy and hard-packed snow conditions. When winter roads are dry or wet, studs actually decrease traction potential. In these conditions the tire tread compound is the foundation of tire grip. To a small but noteworthy degree, studs interrupt the crucial interaction between the tire tread and the road surface, which can have a negative effect on stopping distances. Studs are also known to produce additional road noise, including a ticking sound as the studs contact the pavement. And in snowy, slushy, or mixed conditions, the traction advantages of studs are minimal. As is often the case, motorsport provides us with insight into the best tire designs and technology for optimal grip and speed in select conditions. For the wintry stages of the WRC Rally Sweden where ice, hard-packed snow, and frozen dirt and mud conditions are the norm, Michelin installs a whopping 384 studs in each tire. In dry and wet, paved motorsport conditions, studs are absent. 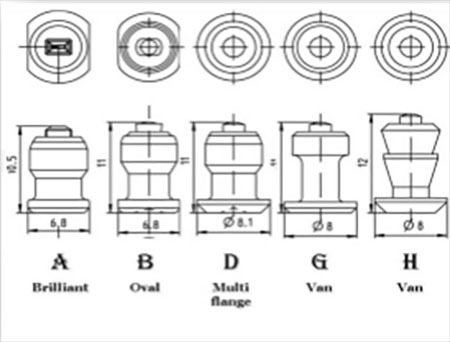 The tire design emphasis is on maximizing the tire tread interaction with the road surface. Another disadvantage is the toll that studs take on paved roads. The Washington State Department of Transportation claims that studded tires wear down pavement at a much higher rate than normal tires. Studded tires also cause rutting of roads, especially interstate highways, which can lead to safety problems like pooling water, excessive tire spray, hydroplaning, and other vehicle control issues. The bottom line is that you should only install and use studs if there’s a distinct performance and traction advantage in doing it. That means regular travel on ice-covered or hard-packed snowy roads is subject to the state law restrictions detailed below. Do I need to stud studdable winter tires for winter performance benefit? Like studless options, studdable winter tires feature special tread compounds that stay flexible and grippy in freezing temperatures, as well as sipes and other standard winter tire design concepts. Therefore, you could use studdable winter tires without studs and still experience the wintertime traction benefits of a true winter tire. If and when icy road surface conditions become the norm and expectation (regular travel on frozen dirt back roads), studs could then be installed. Are studdable winter tires the “right” choice? Once again, studies show that studded winter tires perform best on ice while studless winter tires deliver the best handling and braking when the temperature is below freezing, on both wet and dry pavement. The performance difference is minimal between studded and studless winter tires in snow, slush, and other winter conditions outside of hard-packed snow and ice. If you think you’d like to try out a set of studded tires, there are a few other things to take into consideration, number one being where you live. 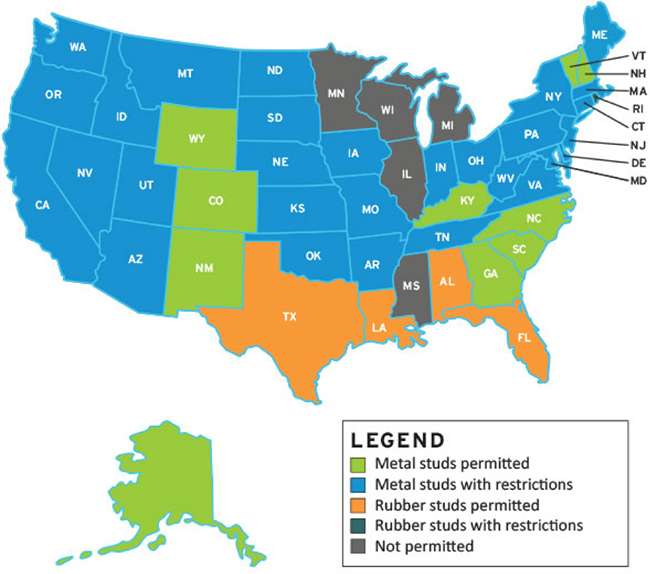 Metal studs are prohibited in 11 states: Alabama, Florida, Hawaii, Illinois, Louisiana, Maryland, Michigan, Minnesota, Mississippi, Texas, and Wisconsin (some of these states allow tires with rubber studs; Maryland allows studs only in certain counties). Only six states permit the use of studded tires without restriction: Colorado, Kentucky, New Hampshire, New Mexico, Vermont, and Wyoming. Most of the remaining states allow studded tires with date restrictions. For example, in Washington State where the TireBuyer offices are located, studded tires are permitted from November 1-March 31. If you decide to use studded tires, be sure to follow your state’s current laws or risk paying a hefty fine. See the chart below for detailed studded tire laws for each state. So, the choice between studdable vs studdless winter tires comes down to a personal decision based on where you live, where you’ll be driving, and what kind of winter weather you expect to encounter. If you’d like some additional help figuring out which kind of winter tires are best for your specific situation, our tire and wheel experts are ready to help. Just give us a call at (866) 961-8668, or explore the full selection of studdable and studless winter tires here.